Representative Honours: Northern Ireland: Full Caps (2014-). 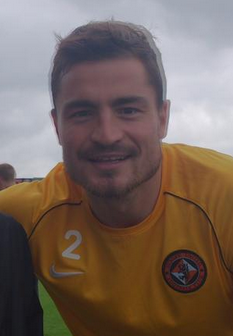 Club Honours: (with Dundee United) Scottish Cup Runner-Up 2013/14; Scottish League Cup Runner-Up 2014/15. Awards: SPFL Player of the Month September 2014, February 2016. Dundee United defensive player called-up for the first time as a late-addition for the squad to face Cyprus in March 2014. He qualifies for Northern Ireland through his Larne-born father.